This Healthy Moose Munch snack mix is a salty and sweet treat. 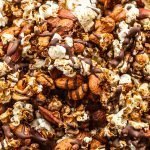 Dairy-free coconut caramel and chocolate cover crunchy popcorn, almonds, and cashews. Add the coconut sugar and sea salt to a medium saucepan over medium heat. Warm for one minute. Add the coconut milk and heat until the mixture comes to a full, rolling boil over medium heat. Remove from the heat and let it cool while the oven preheats so it’s not scalding. Mix the popcorn, almonds, and cashews together in a bowl. Dump the popcorn and nuts from the bowl and distribute evenly between two sheet pans lined with parchment paper. The parchment is important so everything doesn’t stick. Drizzle the coconut cream caramel evenly over both sheet pans, using your hands to toss the popcorn and nuts in the caramel to coat them. It’s OK if not every piece is super covered. Bake for 1 hour, and let the moose munch cool in the sheet pans before breaking it into clusters. Melt the chocolate chips and drizzle evenly over the sheet trays. Let the chocolate set before breaking everything apart again into clusters and serving. *you could also line the pan with a Silpat, but just greasing it won’t do as good of a job.